Uncovering the magic: How serverless platforms really work! Working with a serverless platform like OpenWhisk almost feels like practicing black magic. You insert code and it just executes that code as often as you want and need. You never hit deploy. You never worry about scaling. You never manage anything around it. It. Just. Works. Witchcraft you say? Not exactly! This article will explain what happens when you invoke an action in OpenWhisk. It’ll explain all the components of the OpenWhisk deployment and give you an overview of the roles played by each of them in the system. Today we’ll uncover the secret, ancient spells used underneath. Well, not really secret. OpenWhisk is open-source! Being an open-source project, OpenWhisk stands on the shoulders of giants. And boy are those giants tall! Nginx, Kafka, Consul, Docker, CouchDB… They’ll all come together to form a “serverless event-based programming service”. To explain all the components in more detail, I’ll trace an invocation of an action through the system as it happens. An invocation in OpenWhisk is the core thing a serverless-engine does: Execute the code the user has fed into the system and return the results of that execution. To give the explanation a little bit of context, let’s create an action in the system first. I’ll use that action to explain the concepts later on while tracing through the system. The following commands assume that the OpenWhisk CLI is setup properly. First, we’ll create a file action.js containing the following code which will print “Hello World” to stdout and return a JSON object containing “world” under the key “hello”. We create that action using. Done. Now we actually want to invoke that action. To do so, we type. Now… What actually happens behind the scenes in OpenWhisk? Note the $userNamespace variable here. A user has access to at least one namespace. For simplicity, let’s assume that the user owns the namespace where myAction is put into. The first entry point into the system is through nginx, “an HTTP and reverse proxy server”. It is mainly used for SSL termination and forwarding appropriate HTTP calls to the next component. There isn’t more to it really. Not having done much to our HTTP request, nginx forwards it to the Controller, the next component on our trip through OpenWhisk. It is a Scala-based implementation of the actual REST API (based on Akka and Spray) and thus serves as the interface for everything a user can do, including CRUD requests for your entities in OpenWhisk and invocation of actions (which is what we’re doing right now). The Controller first disambiguates what the user is trying to do. It does so based on the HTTP method you use in your HTTP request. As per translation above, the user is issuing a POST request to an existing action, which the Controller translates to an invocation of an action. Given the central role of the Controller (hence the name), the following steps will all involve it to a certain extent. Now the Controller verifies who you are (Authentication) and if you have the privilege to do what you want to do with that entity (Authorization). The credentials included in the request are verified against the so-called subjects database in a CouchDB instance. In this case, it is checked that the user exists in OpenWhisk’s database and that it has the privilege to invoke the action myAction, which we assumed is an action in a namespace the user owns. The latter effectively gives the user the privilege to invoke the action, which is what he wishes to do. As everything is sound, the gate opens for the next stage of processing. Slowly we’re getting to the meaty part! As the Controller is now sure the user is allowed in and has the privileges to invoke his action, it actually loads this action (in this case myAction) from the whisks database in… yes… CouchDB. The record of the action contains mainly the code to execute (shown above) and default parameters that you want to pass to your action, merged with the parameters you included in the actual invoke request. It also contains the resource restrictions imposed on it in execution, such as the memory it is allowed to consume. In this particular case, our action doesn’t take any parameters (the function’s parameter definition is an empty list), thus we assume we haven’t set any default parameters and haven’t sent any specific parameters to the action, making for the most trivial case from this point-of-view. The Controller (or more specifically the load balancing part of it) has everything in place now to actually get your code running. It needs to know who’s available to do so though. Consul, a service discovery, is used to keep track of the executors available in the system by checking their health status continuously. Those executors are called Invokers. The Controller, now knowing which Invokers are available, chooses one of them to invoke the action requested. Let’s assume for this case, that the system has 3 Invokers available, Invoker 0 to 2 (of course we count zero-based, we’re programmers after all), and that the Controller chose Invoker 2 to invoke the action at hand. The system can crash, losing your invocation. The system can be under such a heavy load, that the invocation needs to wait for other invocations to finish first. The answer to both is Kafka, “a high-throughput, distributed, publish-subscribe messaging system”. Controller and Invoker solely communicate through messages buffered and persisted by Kafka. That lifts the burden of buffering in memory, risking an OutOfMemoryException, off of both the Controller and the Invoker while also making sure that messages are not lost in case the system crashes. To get the action invoked then, the Controller publishes a message to Kafka, which contains the action to invoke and the parameters to pass to that action (in this case none). This message is addressed to the Invoker which the Controller chose above from the list it got from Consul. Once Kafka has confirmed that it got the message, the HTTP request to the user is responded to with an ActivationId. The user will use that later on, to get access to the results of this specific invocation. Note that this is an asynchronous invocation model, where the HTTP request terminates once the system has accepted the request to invoke an action. A synchronous model (called blocking invocation) is available, but not covered by this article. This is the most fun part, the heart of OpenWhisk. The Invoker. The Invoker’s duty is… well… to invoke an action. It is also implemented in Scala. But there’s much more to it. 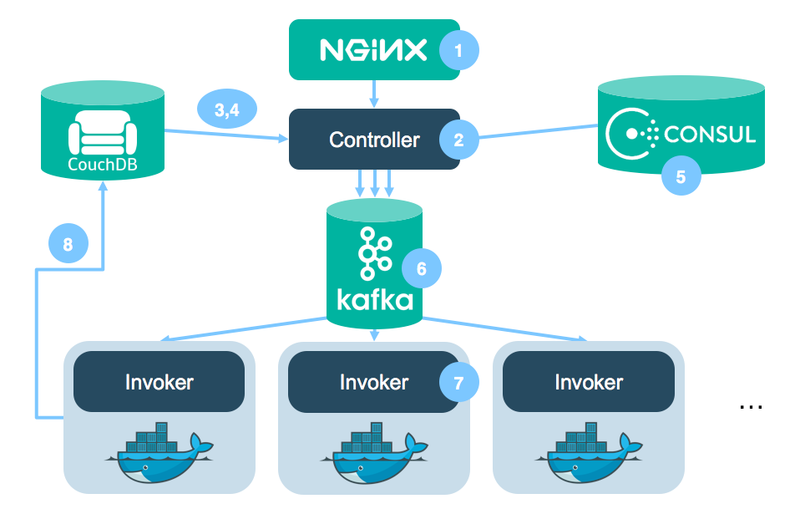 To execute actions in an isolated and safe way it uses another huge giant to stand on: Docker. Docker is used to setup a new self-encapsulated environment (called container) for each action that we invoke in a fast, isolated and controlled way. In a nutshell, for each action invocation a Docker container is spawned, the action code gets injected, it gets executed using the parameters passed to it, the result is obtained, the container gets destroyed. This is also the place where a lot of performance optimization is done to reduce overhead and make low response times possible. These optimizations will be covered in another article, you can bet on that. In our specific case, as we’re having a Node.js based action at hand, the Invoker will start a Node.js container, inject the code from myAction, run it with no parameters, extract the result, save the logs and destroy the Node.js container again. As the result is obtained by the Invoker, it is stored into the whisks database as an activation under the ActivationId mentioned further above in the article. Where does the whisks database live? Well, you guessed it… CouchDB. Note how the record contains both the returned result and the logs written. It also contains the start and end time of the invocation of the action. There are more fields in an activation record, this is a stripped down version for simplicity. So that’s it. We’ve seen how a simple wsk action invoke myAction passes through different stages of the OpenWhisk system. The system itself mainly consists of only two custom components, the Controller and the Invoker. Everything else is already there, developed by so many people out there in the open-source community. This is only the first of many articles explaining how OpenWhisk works internally. It scratches merely the surface of it. Do you want more? You want to know how we optimized docker operations to cut end-user latency? Read the next article on how the Invoker works internally: Squeezing the milliseconds: How to make serverless platforms blazing fast! Markus Thömmes is a leading contributor to the Apache OpenWhisk project. He loves serverless and ☁️ in general. Follow him here on Medium and on Twitter for more deep-dive information about serverless platforms. Software Engineer. IBM OpenWhisk contributor. Scala enthusiast. Cloud-native citizen.